We have had over 20 years experience in supplying and erecting quality Metal Sheds and have seen many changes in the industry. Our aim is to provide the best quality sheds at the most affordable prices. Our current range of sheds include products from many suppliers including EasyShed, Absco, Spanbuilt and Oldfields. As a supplier to the insurance industry we can provide a spare parts and repair service for many brands including Steelchief Sheds, Victa-Treco and Metalform Sheds. 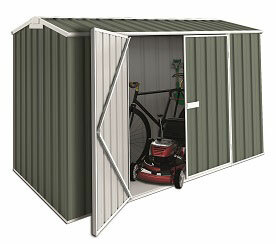 The EasyShed range is supplied in kit form as a boxed shed for ease of transportation nationwide. There are 4 roof styles available: Flat roof, Skillion roof, Gable roof and the steeper pitched Federation roof to complement both period and modern architecture. We have an abundance of standard sizes and we can also custom make special sizes for tight spaces as well as offering different height options. Extra doors, wider doors, windows, skylights, shelving, steel frames and tool holders are just some of the other options available so whether you need a small locker or a large workshed we can provide just what you need in a choice of 24 colours or an un-painted zinc finish. We can arrange for you to pick up your shed from our Mornington Store or we can provide a full Delivery and Installation Service including Timber Floors, Concrete slabs and Council Permits for Mornington Peninsula and South-Eastern Suburbs clients. The kit sheds and EasySheds are available nationwide and are delivered to your door. The photos are just a sample of our recently completed sheds so for a complete range Download our brochures or contact us.